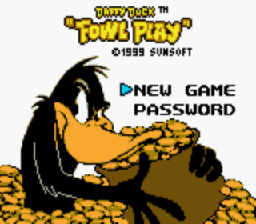 Play Daffy Duck Fowl Play Now! Daffy Duck has always wanted to be rich, and now he is on a search for treasure and riches. But like always, Daffy Duck's long time arch-rival in Looney Tunes, Bugs Bunny is out to stop him. Look for food to heal yourself, and collect money on the way. Graphics are good GBC graphics and sound is decent. If you like the Looney Tunes, you will enjoy this action/adventure game. Guide Daffy through each stage and look for treasure. There are six stages, with a treasure chest at the end of each one. Stage one takes place in the country. The worst baddies on this stage are a bulldog who punches you to a pulp and a cop who whacks you with a nightstick. But there are others: a chicken, bear traps, and rakes. At the end of the stage Bugs drops anvils on you in an attempt to stop you from reaching the treasure chest. Stage two takes place in a lakeside area. Here, look out for the Bulls; they charge. Others to look out for are birds, porcupines, fire traps, boulders, and cliffs. This level takes place in the snowy mountains. Watch out for the abominable snowman, he will try to hug you to death. At the end of the level Bugs hurls snowballs at you to try and stop you from reaching the treasure chest. Also watch where you step, bears pop out of the ice. This one takes place in the dark forest. Watch out for spiders and the pouncing tigers. There are also spikes and flytraps. Also look for piles of dirt with an arrow pointing down. Press down directional and you will find $10000 worth of gold. Welcome to a desert plateau. Jump from cliff to cliff, to reach the end of the level. At the end of this level bugs will drop bombs on you to stop you from collecting the treasure chest. Watch out for scorpions and cactus as well. Blow them away with your dynamite. The Final Stage. This one takes place in Egypt. Start off in the desert and work your way into the tombs. Watch out for bouncing boulders and Anubis dogs with bows. At the end, Bugs has a hovering robot. To defeat him hold B until the TNT count is at 2; then jump and throw it at the robot. Do this about five times and you just beat the game!